Water wells can be a real issue for solar systems. We have many deep water wells in our area and it's not uncommon to have two or three horsepower pumps. Pumps have a high "starting surge" because they have to start under load. This surge can be several times the normal running power required for the pump. Sooo---the system has to be sized to the start surge of the pump. What this results in oftentimes is a system that is two or three times the capacity that it would have been without the pump. That translates to two or three times the cost----you see where this is going. Smaller pumps are not as difficult or costly, but still need to be calculated carefully for solar applications. 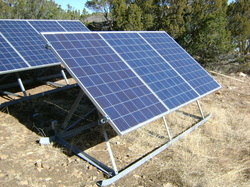 We sometimes use solar well pumps. Solar pumps don't usually provide enough water flow to be used in the normal pressurized water system, so they trickle water into a storage tank during the day and then a small pressure pump (which our solar system CAN run) provides the proper water pressure and flow for normal use. Another possibility with this type of storage system is that the tank might be filled occasionally with a generator and a regular 240 volt well pump while the small pressure pump continues to be powered by our solar system. Here's a typical example. Let's say we have a 1000 gallon tank and the generator/pump can pump 20 gallons per minute into it. To fill the empty tank would take approximately one hour (1000/20=50 minutes) and perhaps one gallon of fuel for the generator. 1000 gallons might (if carefully used) take care of a small family for a month, so you could function for a year on 12 gallons of fuel. How Do I Connect The System To My Home? There are several ways. The simplest and least expensive is to connect an extension cord from the system to your refrigerator and a few essential lights and plug in other devices as needed. 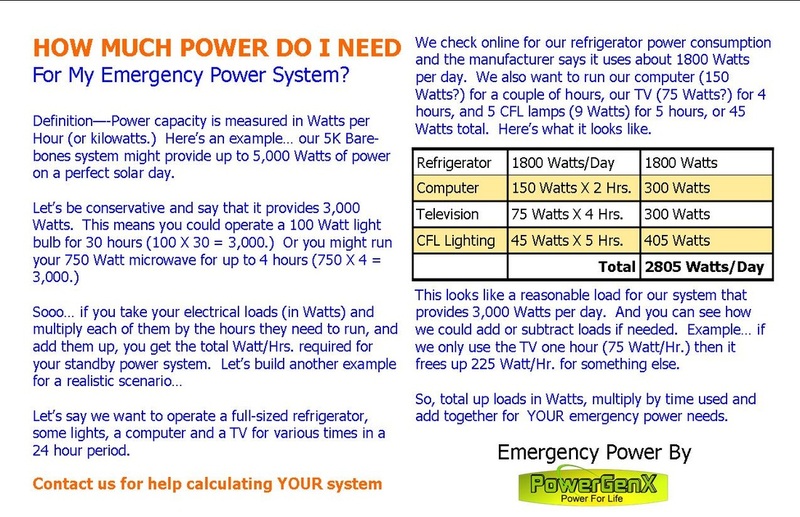 Probably not a good solution for long term, but can get you through a short term power outage. Another solution is to install (usually need an electrician) an auxiliary electrical panel which connects to some of the circuits which you want to use in emergencies. Some of these panels have circuit breakers which can connect either to utility or emergency power. A third process is to install (again, qualified technician) a transfer switch that transfers all of your electrical loads to the emergency system. This can be a manual switch or and automatic relay. You have to be careful in this situation not to turn on too many devices at once, as it may overload the emergency power system (depending on its capacity) and trip some breakers. The AC power (household 110 Volt power) is produced by the inverter from the DC power in the batteries. Here are a few things to check if there is no AC from the inverter. INVERTER --- Make sure inverter switch is ON. Some inverters have several switch positions, on for on/off, one for a remote control, etc. Be sure all switches are in the right position. Inverters are equipped with safety controls which turn them off if they are too hot, batteries get too low, etc. Most reset when the problem is corrected, ie. unit cools off or batteries recharge. Read the manual for your inverter for details. CIRCUIT BREAKER --- The batteries connect to the inverter through a 250 Amp circuit breaker on most of the units. If this circuit breaker is OFF, the system is OFF. This circuit breaker is larger than the 20 Amp unit that connects to the solar panels and charge controller. The battery charge circuit includes the batteries, solar panels, charge controller, 20 Amp circuit breaker, and the wiring that connects all of them. Problems with any one of these can interrupt the current flow into the batteries. BATTERIES ---NEVER allow the battery fluid fall below the plates. You can remove the caps and look down into the cells (carefully---safety glasses are recommended), if the water is below the plastic tubes that extend from the top, fill with distilled water until it touches the plastic tube. Remember that the battery warranties are automatically voided if the plates are not covered. CHECK CONNECTIONS --- Look for loose or corroded connections throughout the system. Tighten any loose connections and loosen and clean any corroded ones. Check solar panel connectors (they snap together) to be sure they are tight. CHARGE CONTROLLER --- Most of the systems have charge controllers with digital displays which can show voltage, current, and/or wattage. Become familiar with these readings with normal use and you can tell quickly when something just isn't right. For example, if the charging amps from the PV (photovoltaic or solar panel) normally is 6-7 Amps in full sunlight, and suddenly it changes to 3 Amps, something is happening that may need help. CIRCUIT BREAKER --- The smaller circuit breaker mounted on the backboard (usually 20 Amps) connects directly between the solar panels and the charge controller. If the breaker is off, no current can flow to the batteries. Also use this circuit breaker to turn off the PV's for storage or transport. The portable solar units are very reliable and normally require little maintenance, but please take some time to familiarize yourself with the ebb and flow of solar power --- it will help greatly when something does go wrong.